It was the first great explosion of gay writing in history. These books were about gay characters. They were written mostly by gay writers. Above all, they were for gay readers. And, as this entertaining chronicle of the emergence of gay literary pride makes clear, it was a revolution that occurred several years before Stonewall! Their characters were mostly out or struggling to get out. The books were definitely out -- out on the revolving paperback bookracks in grocery stores, dime stores, drugstores, magazine agencies, and transportation terminals across the nation for youths and senior citizens, in the cities and the rural areas alike, to find and to devour. 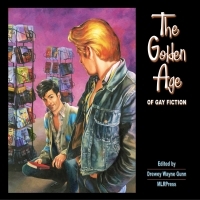 Here 19 writers take you on a tour of this Golden Age of Gay Fiction -- roughly the period between the first Kinsey Report and the first collection of Tales of the City -- paying attention to touchstone novels from the period but, even more, highlighting works of fiction that have been left unjustly to gather dust on literary shelves. Written by authors, scholars, collectors, and one of the publishers, their essays will inform you. They will sometimes amuse you. They will take you into literary corridors you only suspected were there. And the some 200 illustrations, chosen for their historical as well as their artistic interest, provide a visual record of why this was the golden age. It is guaranteed that you will emerge from reading this book with a long list of good reads to request from your favorite booksellers!